As much as I like Halo, I get the feeling that nobody cares about its anniversary as much as Microsoft. Cool receptions to many of its spin-offs suggest to me that it’s something of a manufactured phenomenon that, without the marketing spend to turn each new iteration into an ‘event’, wouldn’t have developed organically. I genuinely do like the series, especially in multiplayer, but a new announcement does tend to provoke eye-rolling more than it would with any of gaming’s other marquee franchises. But without any new multiplayer – or even, more gallingly, old multiplayer – Halo: Anniversary is a good opportunity to go back to the first game and see whether it’s actually as great as the hype would have us believe. 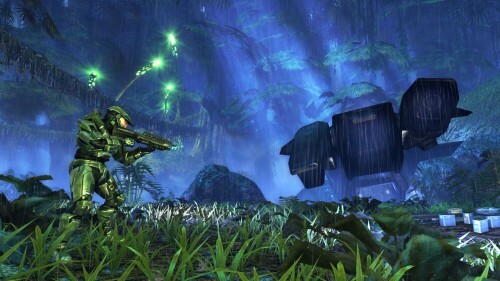 My theory was that the years and a million arguments between fanboys have led to both what Halo did right and what it did wrong being amplified, so while a two-weapon limit and recharging health weren’t the foundation of a new dawn for the 21st Century’s most popular genre, The Library isn’t that bad. Ten years on from my first playthrough, I actually found the Flood quite enjoyable to fight, and what I like and dislike about certain levels has changed dramatically. I love the horror vibe of the enemy-free section in 343 Guilty Spark, for example, but the open battlefields of Assault on the Control Room that I enjoyed in 2002 were overshadowed by the tedious repetition of rooms. Needless to say, doing practically the same level in reverse, only with Flood and without a tank, in Two Betrayals seemed like the low point. First of all, how is the remastering job? While it’s not immediately all that impressive, it’s striking how much has changed when flipping to the original graphics. Looking at that makes me thankful that the graphical overhaul is closer to complete remake territory, and putting it closer to the graphical standards of current games illustrates just how dull a lot of modern shooters are to look at; nowhere will you see such a refreshingly vibrant palette of greens, purples, blues and pinks, and it’s even made the classic graphics look drab in comparison. Too bad that something – possibly the strain of pushing two engines, possibly the 3D, or maybe even a misguided attempt to keep things true to the original Xbox – makes the frame rate inconsistent. This should be running locked at 30fps at the very least, and it undermines the otherwise-lovely presentation. Flaws aside, however, I thoroughly enjoyed revisiting Halo, and after years of seeing it barracked by popular backlash from areas of the community I was surprised by how much I liked it. Bungie did a tremendous job of balancing satisfying weapons, very believable AI and a few truly brilliant level designs that 343 Industries’ was right not to touch in its attempts to modernise it. Is it a remake? Is it an HD remaster? It’s somewhere in between and I like it. More please.